I’m not naturally positive. People think I am because of my books and talks but the truth is that I have to work hard at it. In my quest to become a more positive leader I’ve learned a lot about what works and have seen the power of positive leadership in my own life and countless others. That’s why I’m more than excited to share my new book with you! This book is not based on theory. It is based on real leaders and stories who have demonstrated the power of positive leadership. It’s a comprehensive framework filled with proven principles, new research, compelling stories, practical ideas and practices that will help anyone become a positive leader. I wrote it for the leader of an organization, the manager who leads a small team, the coach who wants to make a greater impact on her players, the principal of a school, the teacher of a class, the parent who is busy and stressed and those in leadership development programs who want to be great leaders. In essence I wrote it for anyone who leads and wants to be a better leader. There is a power associated with positive leadership and you can start benefitting yourself and your team with it today! To celebrate the release we have a few special offers available this week based on the number of copies that you order. Details below. You can read more about the book below as well. These offers are only available through April 29. After that, they go away. 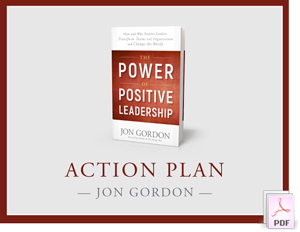 Downloadable Action Plan - A "Power of Positive Leadership" downloadable accompaniment guide to help you and your team turn the ideas from the book into results. 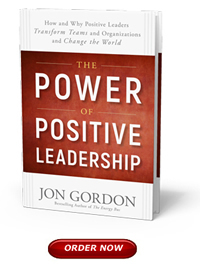 Access to a Live Public Webinar with Jon Gordon - Jon will walk you through the lessons in the book. Exclusive Launch Poster - A downloadable resource / reminder to embrace positive leadership. Online Access to our Create a Culture of Greatness Training Program, complete with workbook and implementation guide ($99 value). RECORDED VIDEO - Jon will record a custom message via video for you and your team that you can use for an event, book study, team building activity, etc. (Message not to exceed 5 minutes in length). To take advantage of this offer, contact daniel@jongordon.com for order details. SKYPE VIDEO SESSION - A private, custom Skype Video training session with Jon for you and your team. (Up to 30 minutes in length, can be scheduled anytime in 2017 at a time that works for both you and Jon). IN PERSON KEYNOTE - Jon will come and deliver a keynote speech to your organization or at your event. (Up to 45 minutes in length, can be scheduled anytime in 2017 at a time that works for both you and Jon, you must cover Jon's travel and lodging). - Only 3 of these packages available, act fast before they are gone! Download a sample chapter of the book here. Discover the Proven Principles and Practices that Make Great Leaders Great! When some people hear the words "positive leadership" they roll their eyes because they think we're talking about Pollyanna positive, where life is full of unicorns and rainbows. But the truth is that we are not positive because life is easy. We are positive because life can be hard. As a leader, you will face numerous obstacles, negativity, and tests. There will be times when it seems as if everything in the world is conspiring against you and your vision seems more like a fantasy than a reality. That's why positive leadership is essential! 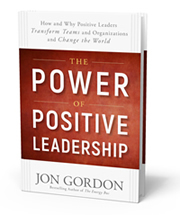 There is a power associated with positive leadership and you can utilize the framework, stories, and practices in this book to start benefiting yourself and your team with it today!